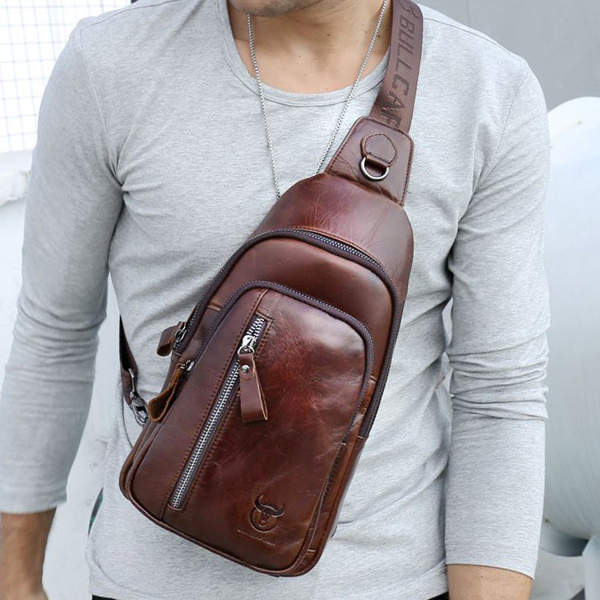 This is a men’s shoulder bag made of top quality PU leather that is soft to the touch. Structured in a way that gives you a lot of space to organize your stuff, it has the main interior pocket, an interior zipper pocket, a front pocket, and a back zipper pocket. It has an adjustable bag measurement, meaning you can choose to rock it as a small bag or a larger bag. By opening the zipper in the side, you get the larger version of the bag. Closing the zipper makes it smaller in size. This is a great feature since it allows you to adjust the bag size according to the number of things you want to carry around. This bag has an adjustable strap for maximum comfort. It is suitable for various occasions, be it for school, travel or business. ThisBullcaptain Shoulder Bag made with genuine leather is a very stylish option for any man who would like to own a shoulder bag. Made of durable material, it is suitable for daily use. It is also lightweight, which makes it comfortable for carrying around for work, school, sport, hiking or any other casual activity. With the main compartment, two front pockets, a back pocket, one inner zipper pocket, and an inner slot pocket, it provides ample storage space. With it, you can stuff in your umbrella, wallet, various cards, electronics, and headphones. Its 120cm strap is adjustable for perfect fit. A headphone cable hole only adds to its casual stylish appeal. This is a perfect shoulder bag that can easily complement your outfit and shoes for a more fashionable look. 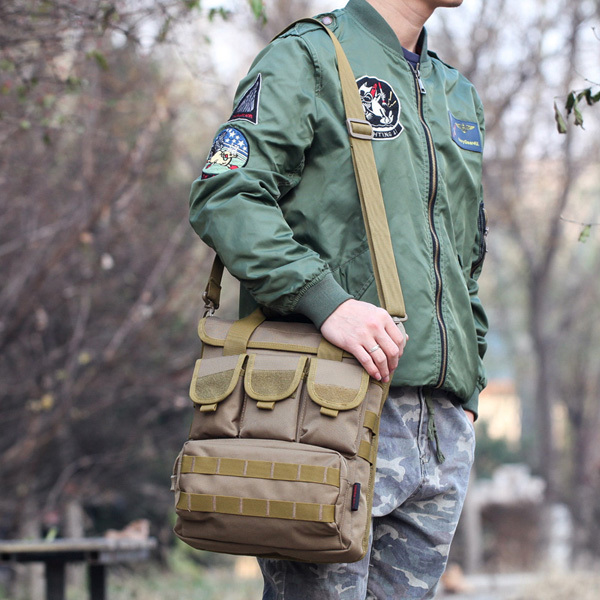 The camouflage pattern never runs out of style, and this tactical shoulder bag gives just that. You can choose from five colors, with three camouflage patterns and two solid ones. Made of durable Oxford material, it ensures a long period of use. It is neat, with a polyester lining on the inside. It has a multi-pocket design that enables you to carry as much as possible on that hiking trip when you go camping, for sporting events and even for travel and work. A men’s shoulder bag is reliable and will keep you organized as you know exactly where to get your frequently-needed things. Let’s not forget that these bags are more professional than backpacks. They are functional while remaining stylish and the above three are a perfect way to get started! 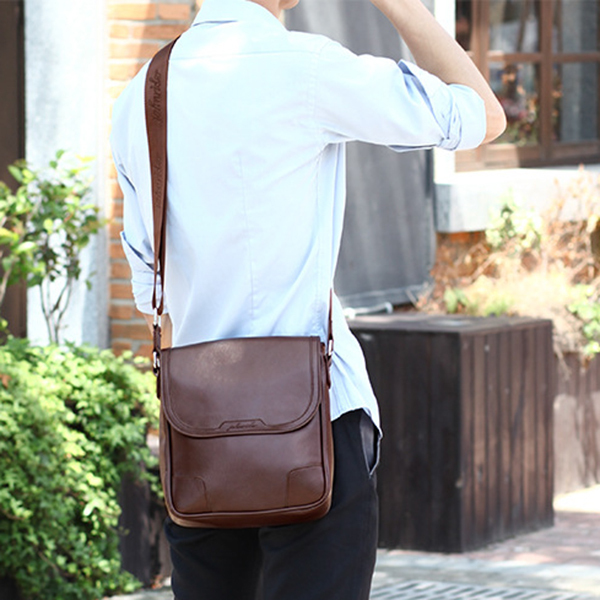 For more stylish men shoulder bags, please go to Banggood.